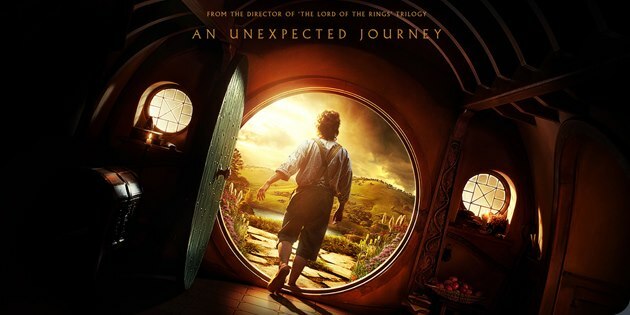 A Film Review "The Hobbit: An Unexpected Journey"
Turning to a never-ending story because of the uncertainity about the director whether to be Guillermo Del Toro or the director of The Lord of the Rings trilogy Peter Jackson and delays due to legal actions, The Hobbit: An Unexpected Journey is now in theatres at last! In 1997, John Ronald Reuel Tolkien’s “The Lord of the Rings” trilogy met more Turkish readers when it published in Turkish. After four years, the movie adaptations by the director Peter Jackson, gained a big success. This time, Peter Jackson and his crew bring the audience together with “The Hobbit” which tells a story 60 years before The Lord of the Rings and it is actually a prologue to the trilogy. In the first place, Tolkien intented to create The Hobbit for his children but then, the big achievement of the book was also unexpected by our beloved philologist himself. The movie, which was released on 14 December in Turkey, was filmed with RED Epic cameras in 3D and with 4k definition which has four times more resolution than High Definition technology. Can not be seen in High Frame Rate 48 frames per second in Turkey, it is the first film in the world that was filmed by using this technology. Because of being two times faster than standard 24 fps, this technology creates more life-like effects. That’s why James Cameron was one of the people who watched the film in the very first place in New Zealand world premiere, since he has been also thinking about filming Avatar sequel in higher frame rate than standard 24 fps. This new technology we have just met had some positive reactions for being more life-like which makes you feel like you are living the moments rather than just watching the scenes and it had some negative reactions for being too much life-like that extinguishes fantasy world or making it clear to see the plasticity of the film studio, making you have a headache, feel dizzy/sick as well. If you remember, we also encountered these kind of discussions and different views about 3D technology when we first met it. Peter Jackson’s view was “This is a new technology and people will get used to it” as well. I wish we could watch the film in HFR to be able to claim our own impressions about it, but maybe next time… I watched 24 fps 3D and IMAX 3D versions of the film. Especially, in front of IMAX giant, it is true that the film is dizzying! But except some rapid close-up moments, it has a dizzying effect in a positive way. You can easily find yourself running away through the tunnels! When we look through the content, it is not a film that cannot be critised by the Tolkien fans who think the film should stick to the book. But we have already seen this situation in The Lord of the Rings trilogy. Actually, Peter Jackson (and the screenwriters) gives his own autograph by doing this. Maybe his success underlies here. He arouses interest and curiosity and keeps alive the excitement, not only with his imagination but also with his variations. He does so to the people who read the book and even to the people who know the whole “legendarium” of Tolkien, no matter they are pleased with it or not. It is even possible to come across with the characters whose names are mentioned in the book just once or a few times, or even the characters who does not exist in The Hobbit book at all. In this way, it contains not only the incidents from The Hobbit but also the characters and elements from The Lord of the Rings, The Silmarillion which is the core of all legendarium, and history of Middle Earth in general. Therewital, Peter Jackson indicated himself that the film is also been nourished by Tolkien’s appendices especially from The Lord of the Rings and other notes. Over and above, there is another point which shouldn’t be missed that Tolkien already wrote at least three versions of the book and even thought about starting to write all over it again. From this viewpoint, it can be seen as a richness than a negativity that not adapting exactly the same from the latest version of the book but including some other different elements as well. Another critism is that there is no profoundness in dwarf characters and it is hard to distinguish them. Perhaps it can be said that it is true for the dwarves who are not in the center all the time in the book. But, we have just started the jouney and we don’t know how much we will be acknowledged about which dwarf and how well we will know them yet. However, the leader of the dwarves and The Company, Thorin, seems to maintain his dominance till the end. Moreover, the actor of the character, Richard Armitage deserves appreciation with his performance and it is a matter of time for him to have a leap in his acting career. Gollum is younger, more gamer and emotional than in The Lord of the Rings. The way he expresses his emotions is successful to make laugh the audience. Of course the role of Andy Serkis who gives life to the character – and directing the second unit at the same time- is beyond argument. In addition, another reason is that the tone of The Hobbit is not as harsh and serious as The Lord of the Rings trilogy. It all starts with this. Gandalf invites this hobbit, young Bilbo, to share in an adventure. Thorin and his fellows wants to go to the Lonely Mountain and take back their treasure and homeland from dragon Smaug and Bilbo should help them as the “burglar” in this adventure. But the worst is not Smaug. Meantime, Bilbo owns the One Ring coincidentally. Gollum, who was a hobbit named Sméagol long ago, sorrows for his lost ring. Worse than this, dark and evil things are rising from the ashes while even high Elves won’t be able to know them until after 60 years. At the end, something appeares long before than it is expected and Smaug wakes up! What will happen next? We will see it next year.